Airports pick up and drop off services. 2 nights accommodation at Kathmandu with all meals. A visit / Darshana of Pashupatinath Temple and Budhanilkantha. Scheduled flight Kathmandu - Nepalgunj - Kathmandu. 1 night accommodation at Nepalgunj on twin/tripple sharing with all meals. Scheduled flight Nepalgunj - Simikot - Nepalgunj. Chartered helicopter flight share by 5 - 6 person Simikot - Hilsa - Simikot. 3 to 5 persons sharing accommodation in Simikot, Hilsa and during Kailash Yatra in Tibet. Three meals a day with tea coffee and sub Meals. Tibet part transfer by deluxe Bus as per group sizes /Truck for Luggage. Nepali Team Leader and Supporting staffs. Tibet travel permit and Chinese Visa. Chinese Package Cost of Kailash Mansarovar Yatra. Upper Humla permit fee and Simikot VDC Charge. Emergency Oxygen Cylinder and First AID kit with appopriate medication facility.All beverages during trip. Extra and excess luggage or cargo charge. Personal horse/pony riding / personal porter charges during Kailash Parikrama. Tips for the supporting staff. Welcome -Receive from Kathmandu international airport. Morning visit Shri Pashupatinath Temple. After lunch, transfer to domestic airport. Fly about 55 minutes to Nepalgunj. Arrival transfer and check in to the hotel. Early morning transfer to Nepalgunj domestic airport. Fly about 50 minutes to Simikot. Further fly 20 Minutes to Hilsa by Helicopter. After breakfast, Cross over the Karnali River to Sher. Embark Nepal and enter Tibet. Drive about an hour to Purang. Meals : Breakfast, Lunch, Dinner & Tea/Coffee. Explore Purang city and market. Drive about one and half hour to Lake Manasarovar. On the way visit/darshana of Ravan Lake. 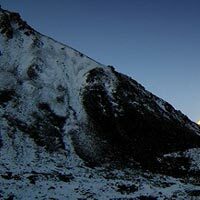 Start Manasarovar Parikrama (Kora) (circumambulation). Reach Chiu Gompa for overnight stay. Meals : Bed tea & breakfast at Purang, Lucnh & Evening hot Dinner. After breakfast, drive to Yamdwar. First day trek of Kailash Parikrama (Kora). Walk approx. 13 km within 6 to 7 hours. Journey starts early in the morning as possible. Trek to Dolma - La (5,670m) above sea level. Divine views of Ganeshkund and Gaurikund during the Parikrama. Meals : Bed tea & breakfast at Driaphuk, packed Lunch with fruits, chocolates and cookies while trekking. Dinner with hot soup and energy drink. Trek about 3 hours to end the Parikrama at Mani Wall . Drive to Hilsa via Purang..
Airlift to Simikot by helicopter and Overnight stay. Meals : Bed tea & breakfast at Zhuthulphuk, Lunch at Darchen or Purang & Evening hot Dinner. Arrival receive and transfer to hotel. Passports with a minimum of 6 months validity and two copies of pp size photographs. The participener must not be above 70 years according the date of birth mentioned on Passport. But there is no any restriction for the minimum age.